Wood, burn marks, silk organza, thread. In "Landscape," I wanted to capture the feeling that I had when I opened Hough's Encyclopaedia for the first time. To enhance (emphasize) the wood grains I applied burn marks celebrating the life of wood. Those burn-marked and pieced-wood elements are captured in between double layers of silk organza by hand stitches. 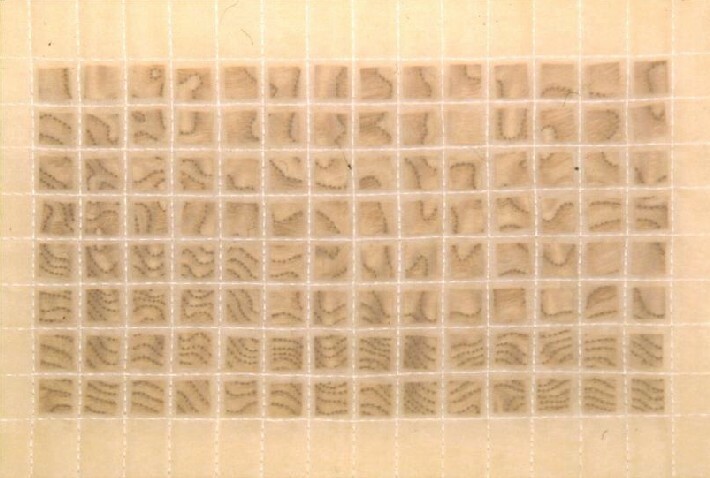 These stitched grids reflect a system referencing a sort of topographical map that we might use to understand nature. The juxtaposition of the grids, organic wood grain, and moiré pattern which were created by doubling the silk organza, also reference the rhythm and harmony between the order and the chaos in nature, which I am very interested in.